As technology has advanced the majority of our communication is happening through a device. Whether it be a computer, tablet, or phone. Ever since I was a kid I’ve used email. I think its highly contributed to my lack of desire to write with pen and paper, which drives my wife nuts by the way. For the past few decades there has been a large focus on how to best reduce the friction between two humans trying to communicate using an electronic device. Texting has become a very popular solution. Looking at the internet trends in 2015 6+ of the Top 10 most used apps globally are Messaging Apps. So its pretty clear there is a large majority of people who prefer sending a text message especially with the younger crowd aged 13 to 24. When you think about these apps their core purpose is very simple in nature. 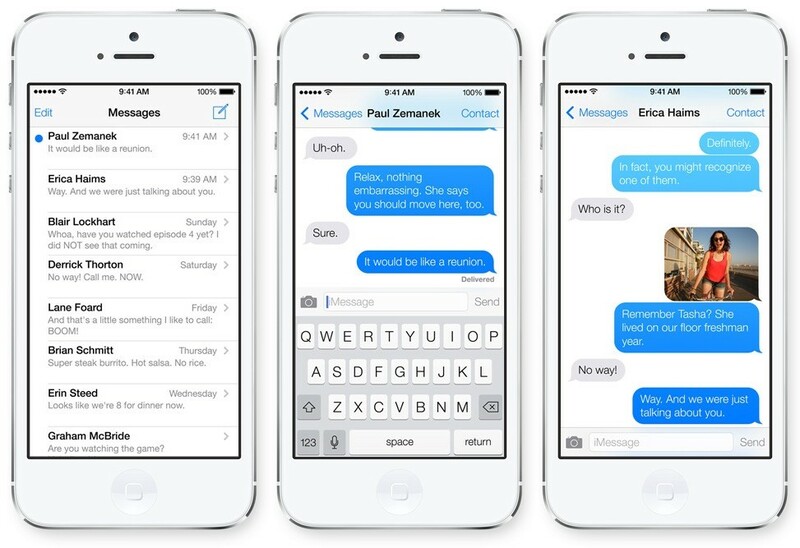 Its two people sending short electronic messages from device to device. 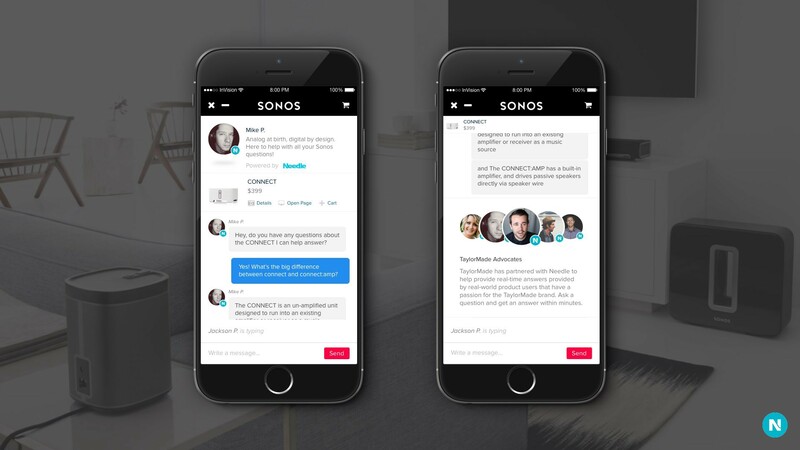 Messaging is a core aspect of all of our lives, so its just natural to use it as the go-to form of communication whenever we want to interact with friends, family and now companies. Picking up the phone has now become the last resort for trying to find the information you need. This is especially so when shopping for products. When shopping for a new product these days we’ve decided, or its just expected from us, as a shopper to do the research necessary to find the best product for our needs. We don’t rely on sales associates to be the product experts in retail anymore. They’re just there to show us where we can find what we’ve already researched and are ready to buy. We’ve done this because its difficult to find a person we trust to help us with our purchasing needs. Often, frankly we don’t trust the advice of the person in the store on what to buy. We’ll ask our friends for advice and search online for any information we can find about the thing we need to buy. Friends are helpful but sometimes they don’t respond quickly or they’re getting their information online just like you. Overall it’s time consuming to find what we need and be confident its the best option. What if there was a person we could chat with when we’re researching the thing we need to buy? What if they knew what they were talking about, actually owned the product we’re interested in and they could answer the questions we have about the products while we’re looking at them online? Well you can, right now. Its called live chat. Many websites and applications have integrated chat into their e-commerce store. The Needle chat solution allows an individual who knows a product, brand, or topic like the back of their hand. They have real experience with the product or industry. Example, A runner is consistently running in races and knows runnning shoes better than most. Has purchased running shoes for many years. Knows the good and bad. Knows which shoes are best for beginners and the more experienced alike. I’d like to chat with that person. So would many other people because Needle has powered over 8 million live conversations about products. 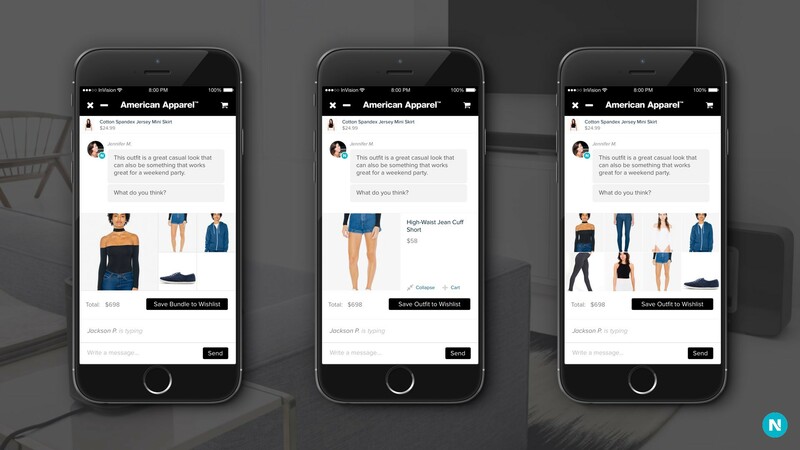 Chat is the solution to empower product experts the connection shoppers need for those last final questions to make their purchase. The problem is chat was originally built around the need for customer service, post purchase conversations. It has always been very rudimentary and simple in nature. Mostly meant for very short questions and conversations. With the ever increasing popularity of social networks we’re seeing many advances in messaging tools, integrations such as photos, videos, audio messages, location integration, stickers, gifs and even flight information. Messaging features and their usefulness is far ahead of anything e-commerce chat has done. Any online chat for that matter. Even with all the competitors in the landscape very few have created the level of experience native Messaging Apps have provided to date. Our goal at Needle has been to raise the bar for the chat experience and catch up with what the world expects out of any messaging service whether online or in an app. I want to show you some of the things we’ve been working on but first I just want to set some ground rules that set the standard for all chat services out there. At the core of all chat solutions is text. You can do a lot with just text but there are some simple things you can do to make the experience more delightful with very little effort. We can learn a lot from what core mobile messaging apps are doing today and apply them to chat. Here are five things required when designing any chat tool today. You’d think these are no brainers but you’d be supprised how many chat tools don’t have these features or affordances. Make it clear who the shopper is talking to at all times. Quickly be able to know which messages are mine and which are theirs. Allow shoppers to see if the other person is typing through indicators. Allow shoppers to easily copy any text within the conversation. Allow shoppers as much visibility into the message they’re typing. Now that we’ve got that out of the way lets go over what we’re building at Needle to provide tools for product experts to help everyday shoppers get quality advice on what to buy. One of the biggest challenges of creating the best experience in online e-commerce chat is that it’s tied to an existing website. This is the big difference between chat and messaging apps. This is not a challenge for messaging apps such as Apple Messages or Facebook Messenger. The shoppers experience doesn’t usually start with chat. Shopping starts with researching existing content about products and then chat enters the picture when users need more specific missing information vital to the purchase decision. Chat tools also have to live on all devices and sizes which comes with its own set of challenges. So how to do you introduce chat as a solution to help the shopper find what they’re looking for through expert advice provided by a professional? It’s a question Needle has been working to solve for quite some time now. Its a different mindset for online shoppers which is hard to change. To help chat not seem like an afterthought to a shoppers experience we provide what we call an “invite”. We’re inviting the user to have a conversation with a product expert if they’re interested. We’ve created smart configuration options to display this invite at times when we feel (and know based off experience and data) are the most appropriate for when a user would feel ready to start their conversation. Usually this happens after a shopper has been on a page for a certain period of time. Something we can track which allows us to make some assumptions such as thinking the shopper might have a question or their level of interest in the product is enough they’re taking the time to know whether its what they need or not. A lot of the decisions we’ve made about when and where to present these invites comes from real life experiences you get in a brick and mortar retail store. When was the last time you walked into a physical store and someone came right up to you before you were even five feet in the door and asked what they could help you with. Its an immediate turn off, even if they were an expert and could be useful. The same feeling can happen while shopping online and we solve this issue with technology creating an opportunity for the product experts to have conversations with the shoppers who are more likely to be ready to have a conversation rather than just brush them off. Once the shopper has opened the door to a conversation there are some other challenges in providing a good chat experience. One of those challenges is chat tools covering the store content once they start. An in-store example would be hanging a big sign in front of a product I’m looking at right when a retail sales employee walks up to me to ask if I have any questions. To solve this problem online our new conversations console will be a full sidebar integration which slides in from the side covering no content on the customers website. This ensures the experience is not hindered in any way by having visible and actionable access to any and all content at all times. This allows the shopper to be able to interact with the product expert while still being able to browse the site without conflict. The most optimal experiences will be provided by e-commerce sites which are already responsive so no content is hindered in this interaction. By doing this we’re also maximizing the visiblity in the conversation and the useful information being provided by the product expert. Allowing the chat to utilize the space more appropriately provides a better experience through the product expert and helps it feel more integrated with the store. With this visbility and space it gives us a better canvas to provide more useful tools for the product experts to better explain what products are best for the shoppers. We’ve designed and tested multiple features for the product expert within the chat tool such as previewing a product, products recommendations, even down to purchasing the product all within the chat. We’re learning from these tests and we’ve found the best solution is providing these tools directly inline within the conversation. One of the largest benefits of our console is the ability to have inline product information in context within the conversation tied directly to an online store catalog. Widgets inline also allows us to add additional tools in a scalable way without introducing added complex user navigation and organization. For instance we have multiple widgets that can be integrated into your chat depending on your needs. Say you were a clothing brand and shoppers are not just there to buy a single item but are looking for an outfit. Giving the product experts the tools to create a collection of items and recommend an outfit would create a richer experience for the shopper. We’re taking a lot of cues from the aforementioned rich features of current messaging apps today. Widgets coupled with a full sidebar creates for the best shopping assistant experience in existance. Another big challenge in designing a sales chat solution is helping the shopper know they can trust the person giving the advice. Our goal is to help the shopper learn as much as they can about the product expert as quickly as possible and with progressive discloser. Given our short attention span these days establishing credibility quickly is very important. Not only for the product experts ego :) but to also set the stage for the credibility of the advice they’re about to give. We do this by providing a quick bio right when the chat opens. This sets the stage as to whom the shopper will be chatting with before they start a conversation. We know people are quick to judge who they’re talking with and decide whether its advice they should really listen to, first impressions matter. We put this front and center. We also know people are more inclined to trust third party verified experts so quickly understanding these are verified product experts outside the walls of the brand adds value and credibilty. 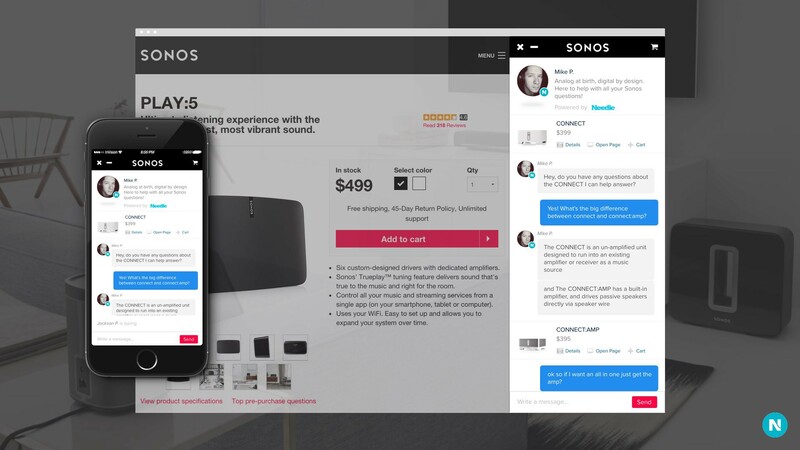 The new conversations console will provide the tools a product expert needs. One of those tools is a rich product recommendation tool. Recommendations are an essential asset for a product expert in helping a shopper find the best product that suits them. Since this is core to the whole shopping experience, we’ve focused a lot of our attention to helping this be a delightful experience. Here are a few ways we’ve optimized the Needle chat to facilitate the delivery of quality product recommendations. When a product expert recommends a product its displayed inline within the conversation. In context to what the shopper is asking about. Shoppers like recommendations but they also want to see the most detailed product image possible. They do this to verify for themselves it’s right for them. They like to see a product up close as if they’re holding it, but not in a way that complicates their experience. To facilitate better product visibility we’ve created a product recommendation widget which is expandable. When a recommendation is first sent to a shopper it displays at its default size. This is an optimal size as to not take up too much vertical space in the chat experience but still provide a rich inline card with product imagery. If a shopper wishes to see a larger image they can expand it and even pinch and zoom right within the chat console. We’ve all used Instagram and we’ve taken a piece of their playbook and added a similar functionality where widgets are pinned to the top of the screen as they scroll so they can quickly return to it within the conversation with just a simple tap. Given our product is used across a wide range of product categories from Sporting Goods, Apparel & Footwear, Electronics, Automotive, Home, to Health & Beauty, we’ve created tools which will help shoppers when they need to not just buy one product but a set of products. 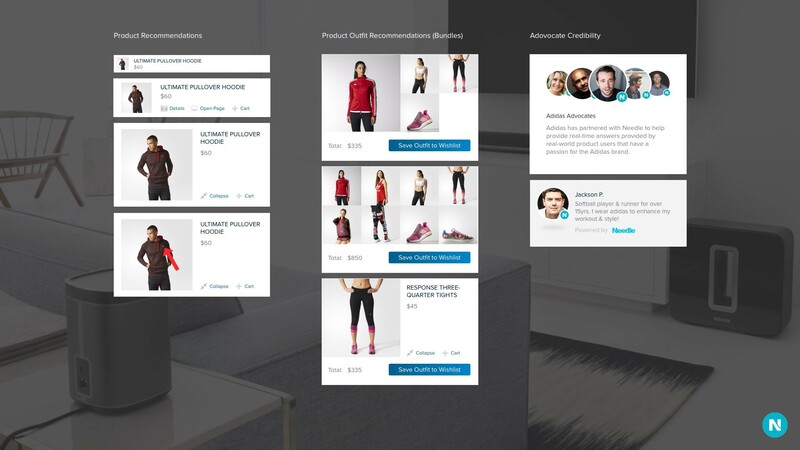 We’ve created what we call the Product Outfit Recommendation widget. This widget allows the product experts to select a set of products to recommend to the shopper. To give you an example a shopper is looking for a new outfit to wear to a party. A product expert could recommend a set of products at a time until they get a sense of what they’re looking for and then create an “outfit” they could purchase all together. This widget provides a way to better communicate with a shopper and allows them to create a collection that fits the style of the shopper. 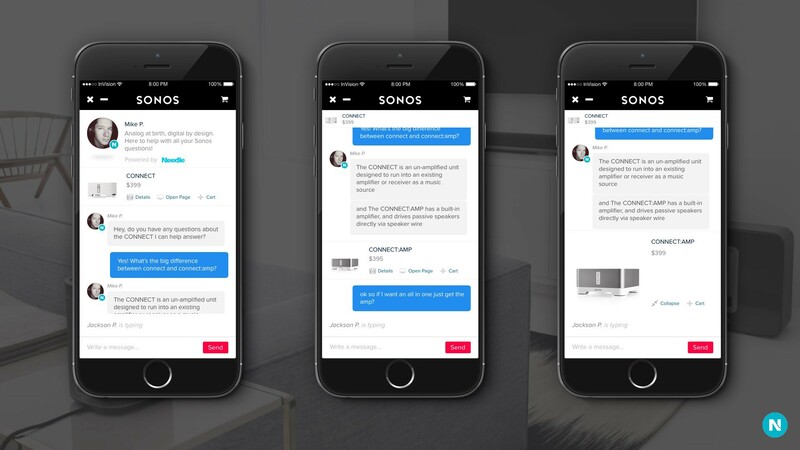 Messaging apps and conversational commerce is becoming more and more common in our lives. As we use these messaging apps in our daily lives people have similar expectations out of chat when shopping online. Chat services need to catch up and they can help people in their purchasing decisions. I believe we’re doing this at Needle. We’re excited to get our new chat tool rolled out to our current customers. If you’re not already using Needle you can see it in action or request a demo. ☞ Needle is the leading e-commerce sales chat platform which strives to make online shopping more personal and trusted. With more than 50,000 certified product experts in all major verticals Needle has powered over 8 million live conversations.